description of photo album from the everyday minerals website: A gorgeous quiet raspberry with dazzling wine shimmer. Makes a great lip color and eye shadow. very nice berry colour, which becomes deeper with more layers. 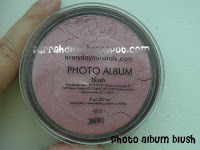 with one layer, this blush looked more pink on my skin than berry, this could be because of the wine shimmer. but with more layers, the berry colour deepens to become closer to the colour seen in the jar. because of the changing colour with more layers, this is another blush where i'm going to have to be careful with my application if i don't want to end up with cheeks that are too pink or too overdone. it would work very nice as an eyeshadow though. verdict: not a colour i would want to apply in the morning when i'm still groggy and can't see straight but very definately a pretty colour for the weekends or nights out. i'll probably use this one as a lip colour as well, i've bought several lip glosses in similar tints before.